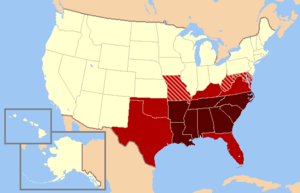 The cuisine of the Southern United States developed in the traditionally defined American South, influenced by African, English, Scottish, Irish, French, Spanish, and Native American cuisines. 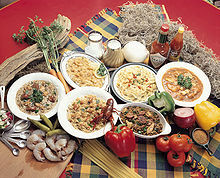 Tidewater, Appalachian, Creole, Lowcountry, and Floribbean are examples of types of Southern cuisine. In recent history, elements of Southern cuisine have spread north, having an effect on the development of other types of American cuisine. Many elements of Southern cooking— squash, corn (and its derivatives, including grits), and deep-pit barbecuing—are borrowings from southeast American Indian tribes such as the Caddo, Choctaw, and Seminole. Sugar, flour, milk, and eggs come from Europe; the Southern fondness for fried foods is Scottish, and the old-fashioned Virginian use of ragouts[ dubious – discuss] comes from the West Country of England. Black-eyed peas, okra, rice, eggplant, sesame, sorghum, and melons, as well as most spices used in the South, are originally African; a preponderance of slaves imported to Virginia in early years were Igbo from the Bight of Biafra,  and down to the present day Southern and Nigerian cuisines have many flavors and elements in common. The South's fondness for a full breakfast derives from the British full breakfast or fry-up. Many Southern foodways, especially in Appalachia, are Scottish or Border meals adapted to the new subtropical climate; pork, once considered informally taboo in Scotland, takes the place of lamb and mutton, and instead of chopped oats, Southerners eat grits, although oatmeal is much more common now than it once was. A traditional Southern meal is pan- fried chicken, field peas (such as black-eyed peas), greens (such as collard greens, mustard greens, turnip greens, or poke salad), mashed potatoes, cornbread or corn pone, sweet tea, and dessert—typically a pie ( sweet potato, chess, shoofly, pecan, and peach are the most common), or a cobbler (peach, blackberry, sometimes apple in Kentucky or Appalachia). 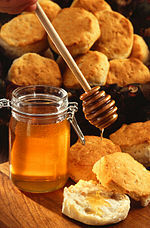 Other Southern foods include grits, country ham, hushpuppies, beignets, Southern styles of succotash, chicken fried steak, buttermilk biscuits (may be served with butter, jelly, fruit preserves, honey, gravy or sorghum molasses), pimento cheese, boiled or baked sweet potatoes, pit barbecue, fried catfish, fried green tomatoes, bread pudding, okra (principally dredged in cornmeal and fried, but also steamed, stewed, sauteed, or pickled), butter beans, and pinto beans. Southern meals sometimes consist only of vegetables, with a little meat (especially salt pork) used in cooking but with no meat dish served. "Beans and greens"—white or brown beans served alongside a "mess" of greens stewed with a little bacon—is a traditional meal in many parts of the South. (Turnip greens are the typical greens for such a meal; they're cooked with some diced turnip and a piece of fatback.) Other low-meat Southern meals include beans and cornbread—the beans being pinto beans stewed with ham or bacon—and Hoppin' John (black-eyed peas, rice, onions, red or green pepper, and bacon). Coleslaw is also popular, both as a side dish and on a variety of barbecued and fried meats. Apart from it, though, Southern cooking makes little use of cabbage. Chains serving Southern foods—often along with American comfort food—have had great success; many have spread across the country or across the world, while others have chosen to stay in the South. Pit barbecue is popular all over the American South; unlike the rest of the country, most of the rural South has locally owned, non-franchise pit-barbecue restaurants, many serving the regional style of barbecue instead of the nationally predominant Kansas City style. Family-style restaurants serving Southern cuisine are common throughout the South, and range from the humble and down-home to the decidedly upscale. In the coastal areas of South Carolina, rice was an important crop, leading to local specialties like " Hoppin' John" (a mixture of rice and black-eyed peas flavored with salt pork) and Charleston red rice. Texas specializes in barbecue and chili and Southern cuisine as well as a regional variation of Mexican food unique to Texas called Tex-Mex. Virginia produces Smithfield ham  and Virginia peanuts. Carolina-style barbecue is common in North Carolina, South Carolina, and Virginia, and is made traditionally from pulled-pork and a vinegar-based sauce. The Appalachian areas have many ramps (a variety of wild onion) and berries. Kentucky is famous for Burgoo and beer cheese. Brunswick stew, which originated in the town of Brunswick, Virginia; or possibly the town of Brunswick, Georgia, is also popular. Southern Louisiana is geographically and politically part of the South, but its cuisine is probably best understood as having only mild Southern influences. Creole cuisine makes good use of many coastal animals—crawfish (commonly called crayfish outside the region), crab, oysters, shrimp, and saltwater fish. Mirliton, or chayote squash, is popular in Louisiana and harder to find in other parts of the South. Chicory coffee is sometimes preferred over the real thing—especially as an accompaniment to beignets. As wheat flour and baking powder/ baking soda became available in the late 19th century, buttermilk biscuits became popular. Cornbread was the most common bread in the mountains, and still remains a staple. Salt, a necessity for life, was always available (much of it coming from Saltville, Virginia), and local seasonings like spicebush were certainly known and used; but the only other seasonings used in the mountains are black pepper and flaked red pepper, along with a little use of cinnamon, nutmeg, and cloves around Christmas. Coffee, drunk without milk and only lightly sweetened, is a basic drink in Appalachia, often consumed with every meal; in wartime, chicory was widely used as a coffee substitute. The gravy for biscuits and gravy is typically sausage or sawmill, not the red-eye gravy (made with coffee) used in the lowland South. Pork drippings from frying sausage, bacon, and other types of pan-fried pork are collected and saved, used for making gravy and in greasing cast-iron cookware. (Note that Appalachia is overwhelmingly Protestant, the Catholic prohibition on meat-eating during Lent had no impact on Appalachian cuisine.) Chicken and dumplings and fried chicken remain much-loved dishes. Cornbread, corn pone, hominy grits, mush, cornbread pudding and hominy stew are also quite common foods, as corn is the primary grain grown in the Appalachian hills and mountains, but are less common than in the past. In contrast to the lowlands, where sugar cane molasses was the usual sweetener, Appalachia mainly used sorghum and honey. European fruits—especially apples and pears—can grow in the mountains, and sweet fried apples are a common side dish. Appalachian cuisine also makes use of berries, both native and European, and some parts of the mountains are high enough or far enough north that sugar maple grows there—allowing for maple syrup and maple sugar production. Wild morel mushrooms and ramps (similar to scallions and leeks) are often collected; there are even festivals dedicated to ramps, and they figure in some Appalachian fairy tales. ^ Fischer, David Hackett; Kelly, James C. (2 February 2016). "Migration to Virginia". Bound Away: Virginia and the Westward Movement. University of Virginia Press. p. 60. ISBN 978-0-8139-1774-0. ^ "Southern favorites". Southernliving.com. Retrieved 2016-01-05. ^ Thier, Dave (December 5, 2012). "In Louisiana, Growing Rice to Trade on Some Creatures That Eat It". The New York Times. New York City. Retrieved July 10, 2016. ^ "Legislative Information System". leg1.state.va.us. Retrieved 16 October 2017. ^ "Alabama Catfish Producers | Alabama Farmers Federation | ALFA Farmers Federation". alfafarmers.org. Retrieved 2016-08-11. ^ Brasseaux, Ryan A.; Brasseaux, Carl A. (1 February 2014). "Jambalaya". In Edge, John T. (ed.). The New Encyclopedia of Southern Culture: Volume 7: Foodways. University of North Carolina Press. p. 188. ISBN 978-1-4696-1652-0. ^ Anderson, E. N. (7 February 2014). Everyone Eats: Understanding Food and Culture, Second Edition. NYU Press. p. 106. ISBN 978-0-8147-8916-2. ^ Davidson, Alan (11 August 2014). "Jollof rice". The Oxford Companion to Food. Oxford University Press. p. 434. ISBN 978-0-19-967733-7. ^ Wei, Clarissa. "An Illustrated History of Lowcountry Cuisine". Retrieved 24 January 2017. ^ "G&G's Fast-Food Breakfast Biscuit Taste Test – Garden & Gun". Gardenandgun.com. 22 January 2016. Retrieved 16 October 2017. ^ "Map: McDonald's all-day breakfast pits muffins against biscuits". Nrn.com. 5 October 2015. Retrieved 16 October 2017. Edge, John T., ed. (2007). The New Encyclopedia of Southern Culture Volume 7: Foodways. University of North Carolina Press. ISBN 978-0-8078-5840-0. JSTOR 10.5149/9781469616520_edge. Ferris, Marcie Cohen (2014). The Edible South: The Power of Food and the Making of an American Region. Chapel Hill, NC: University of North Carolina Press.